Live Puzzles 2: Wild West Bugs! is an iPhone game developed by Sky Leo/Vladmir Pletnev.Aimed at toddlers and babies in particular, this kid-friendly app is packed with colorful puzzles, images, characters, and all kinds of delightful things for growing minds to enjoy. Live Puzzles 2 by Sky Leo is the second entry in the Live Puzzles series for youngsters, boasting a combination of energetic music, upbeat art, and charming animations. Live Puzzles 2: Wild West Bugs! is described as educational. As a parent, your views on what is educational and what is not may vary from the perception of others. While there are bugs and fruits aplenty, this game is aimed at the very young: don’t expect kids to be “educated” on the types of creatures or scientific names, or anything like that. 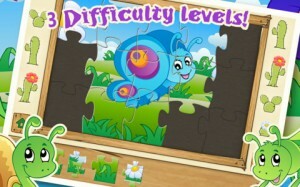 This game is more about entertainment, but it’s a kind of learning play thanks to the puzzles. 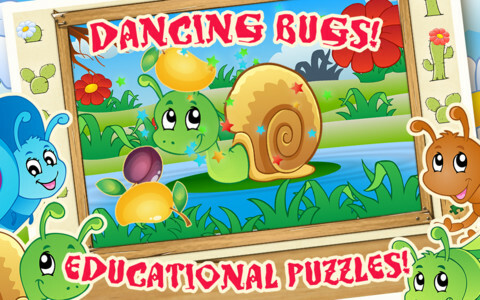 Upon finishing a puzzle, the player is rewarded with an animation of a dancing bug and a variety of fruits flying up on screen. This is sure to delight young kids. This would be a great game for kids and parents to play together as a means of bonding, or improving communication skills. Featuring 3 difficulty levels, simple drag and drop controls that are intuitive even for young children, and great visuals, Live Puzzles 2: Wild West Bugs! 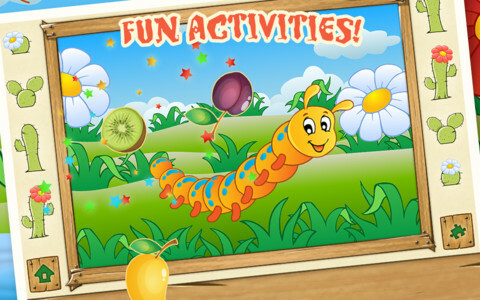 is a fun game for kids that is worth checking out. The HD graphics are very nice, and the background music really sets the tone for hours of fun gameplay. Live Puzzles 2: Wild West Bugs!is compatible with iPhone 3GS, iPhone 4, iPhone 4S, iPhone 5, iPod touch (3rd generation), iPod touch (4th generation), iPod touch (5th generation) and iPad. Requires iOS 4.3 or later.